The aim of raising global awareness on the multitude of benefits of pulses was integral to the International Year of Pulses. This coffee table book is part guide and part cookbook— informative without being technical. 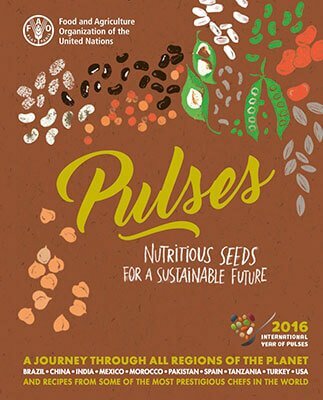 The book begins by giving an overview of pulses, and explains why they are an important food for the future. It also has more than 30 recipes prepared by some of the most prestigious chefs in the world and is peppered with infographics. Part I gives an overview of pulses and gives a brief guide to the main varieties in the world. Part II explains step-by-step how to cook them, what to keep in mind and what condiments and instruments to use. Part III underscores the five messages that FAO conveys to the world about the impact pulses have on nutrition, health, climate change, biodiversity and food security. Part IV illustrates how pulses can be grown in a garden patch with easy gardening instructions and how they are grown in the world, highlighting major world producers, importers and exporters. Part V takes the reader on a journey around the world showing how pulses fit a region’s history and culture and visits 10 internationally acclaimed chefs as they go the market to buy pulses. Back at their restaurant or home, each chef prepares easy dishes and gives their best kept secrets. Each chef provides 3 recipes that are beautifully illustrated.